Private equity firm Cerberus Investments has formed a holding company (2006) named Freedom Group that is readying an IPO to raise some cash, going for $200 million or so based on reports from October, 2009. It is hard to believe that Cerberus is already broke, in light of the $4 billion in taypayer dollars they took during their attempt at running Chrysler, but never gave back. In any case, the Freedom Group of Companies has Remington as its most well-known brand. According to recent SEC filings, Freedom Group appears to be losing market share. Net sales for the three months ended March 31, 2010 decreased by 21.7%, as compared to the three months ended March 31, 2009. Centerfire rifle sales decreased 27.8% as compared to the prior-year period. Shotgun sales lost 4.9% as compared to the prior-year period. Rimfire rifle sales by decreased by 14.4% as compared to the prior-year period. Other companies for which information is available, such as Ruger, Smith & Wesson, and Winchester ammunition have all reported increases in 2010: Winchester Ammunition stunningly so. Make of all this what you will. Over the last couple of weeks Freedom Group has been intentionally leaking bits and pieces about the late year release of the Versamax, in the form of a few cryptic text teasers and a few 7-10 second YouTube videos to try to create a buzz. At the same time, exhibition shooting specialist Patrick Flanigan has announced a new sponsor and a new gun, rumored to be Remington-- but not confirmed. So what is the Versamax? It is presented as a $1600 MSRP plastic-stocked gas-actioned autoloader in 12 gauge with a 3-1/2 inch chamber designed to compete against the $1450 Beretta Xtrema2, the $1500 Browning Maxus. These are all gas guns, all MSRP prices are for basic camo versions. 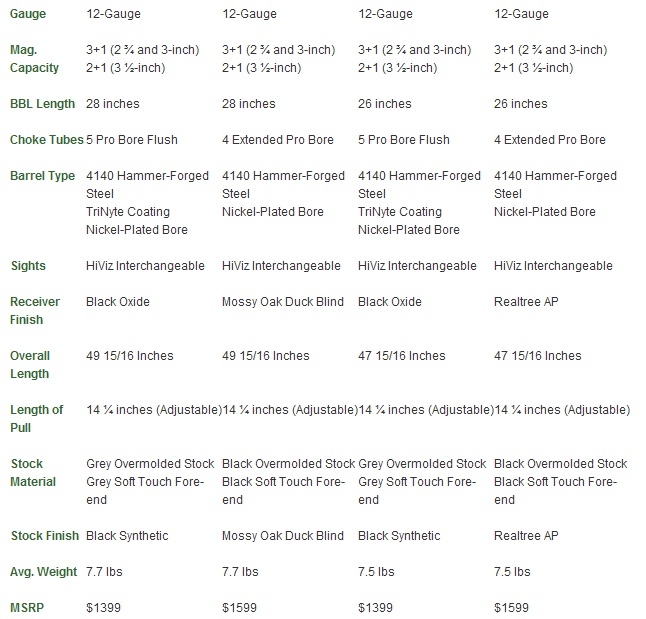 As a 3-1/2 in.gun, it will also go up against the $1400 Benelli Super Black Eagle II American, the $1759 Benelli SBE-II Camo Comfortech, and the $1625 Beretta Xplor Unico A400 to some extent. All this prices are published retail numbers, typically discounted a bit at point of sale. The Versamax's vent rib, above, looks like it came from the Benelli SBE-II, below. Is the Versamax a stylistic attempted copy of the Benelli Super Black Eagle II? The stock comb, trigger guard, shell carrier release, and vent rib profile look like they could have been ripped right off of an SBE-II. You be the judge on that one. If you called it a gas-operated take on the SBE-II style, that would be as accurate as anything else as this stage of the game. The raised comb in the Remington-supplied picture of the camo version, below and to the right, is reminiscent of some Benelli Cordoba or SuperSport models as well. If imitation is the sincerest form of flattery, it seems that the folks at Benelli's Urbino, Italy facility should be quite flattered. The stepped raised rib, the shell carrier release, the trigger guard, and the knock-off of Benelli's ComforTech comb all scream Benelli. The profile of the gun itself strikes me as eerily Super Black Eagle-esque, if there is such as thing. It is the most expensive 12 gauge hunting autoloader that Remington has ever released, by no small margin. The "any load any time" claim by Remington for the Versamax might seem puzzling, as recently tested Maxus, Super Black Eagle II, Xtrema2, and A400 3-1/2 in. guns all do that. The 11-87 didn't, though, requiring the "barrel seal activator" for 2-3/4 inch shells. Perhaps that's what they are referring to? It wouldn't be considered anything remotely new at this stage of the game, if you consider Beretta, Benelli, Browning models that have featured this for over a decade, along with any number of slide-actions that do not rely upon shell function at all to operate without drama. It looks like Remington has added adjustment shims for drop to a shotgun. Shim adjustments have become somewhat common fare since the Beretta 303 and Browning B-80 autoloaders of about thirty years ago, so for many the reaction will be "about time." With an aluminum receiver, lighter weight than the old 1100 and 11-87 models is a virtual certainty. Apparently, that indeed the case, though the Versamax stated weights leave it heavier than the Super Black Eagle II, Browning Maxus, and Beretta A400 Unico. As Freedom Group has only been around since 2006, with Freedom Group / Remington since 2007, they are one of the newest, most inexperienced gun companies around from a management perspective. The Versamax appears to be a gas-operated form factor and styling knock-off of the Super Black Eagle II, joining the increasingly crowded genre of 3-1/2 inch chambered plastic stocked twelve gauge autoloaders. The 3-1/2 inch Versamax has reportedly been "tested" in Argentina, although the idea of getting a 3-1/2 inch chambered twelve gauge to drop a four ounce or so dove makes no particular sense. The Argentina ritual doesn't make a lot of sense (unless you are headed to Argentina, that is), but it has become a standard ploy these days regardless of brand. The Turkish-made Weatherby (ATA Arms) and the Benelli Vinci are two shotguns that have had the benefit of Argentina testing. What would be far more newsworthy is if a new shotgun actually went to Argentina and failed. As far as I know, it has never happened. Remington has claimed that some 250,000 rounds have been fired through just one gun over the last year without failure. A one gun test of this sort of a tool-room prototype doesn't make any sense at all, but marketing doesn't have to. 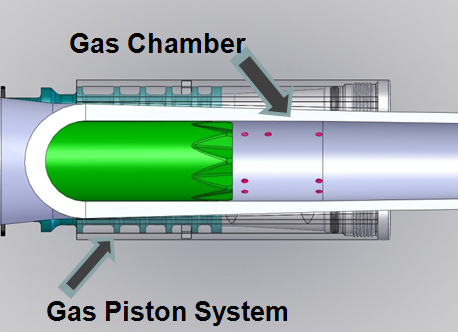 The gas system of the Versamax is a multi-ported barrel array with seven ports in the chamber, ports that are blocked off in concert with the unfolded shell length. Here, of course, the so-called leak is no leak at all but just a very short on information series of bits and bytes intentionally published by Freedom Group. While the style of the VersaMax is surprisingly Benelli, the gas system sounds like a new take-off on the Benelli M4 gas action, albeit a tricky one. It is the gas porting itself that is the most interesting part of this shotgun, at least in my view. The Versamax action retains two O rings, considered to be the weak point of the Benelli M4 action in dusty, gritty conditions. The dual piston system of the Versamax, close to the receiver, is closely-related to the well-known Benelli M4 gas action, also known as the M1014 Joint Service Combat Shotgun. Here, U.S. Marine Corps Cpl. Jonathan E. Knight, a member of the Security Augmentation Force, fires a few rounds with the M-1014. Those with the unfortunate propensity to praise or condemn the Versamax do so without basis. 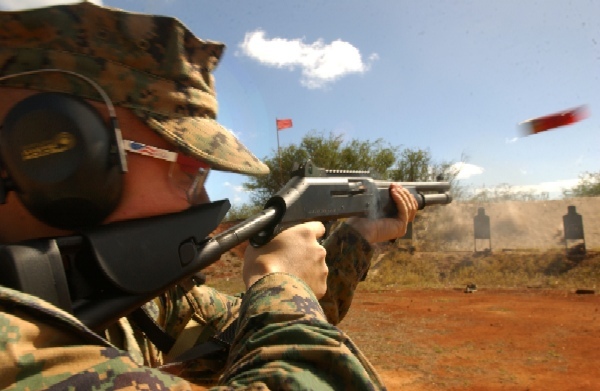 There has yet to be an autoloading shotgun from any brand, of any source of manufacturer, that has lived up to every jot and tittle of its marketing claims. Not one. Whenever a new model is announced in the form of a couple of prototypes, they often have little to do with actual mass-produced production article. All of this is no news to those who understand initial guns are tool-room guns, not formed on a production line from mass-produced, sourced, or vendored parts. The actual retail product is invariably different, sometimes dramatically so, from a hand-fitted prototype. This holds true regardless of brand, regardless of make. At this juncture, the Versamax is neither deserving of praise nor of rubuke, as it does not yet exist as a readily available retail product. Until it hits distribution, it is essentially vaporware, as in Gold Label vaporware. We all know this, but patience is not something many can tolerate. The recoil pad of the Versamax appears to be a somewhat thicker version of the "SuperCell" pad. I can almost hear the "fastest cycling, softest shooting, most reliable" mantra coming, joining the many other fastest cycling, softest shooting, most reliable shotguns already out there. So can you, if you listen close enough. That isn't shame on Remington as much as it is "Shame on everyone!" Nevertheless, it has been decades since the Remington brand has had a competitive autoloader, so who knows? This just might be it. Several things are interesting about this shotgun, insofar as a Remington-branded product. Dropping steel receivers for aluminum is quite a change from older Remington models. The blocking off of ports, if successful, would suggest that three inch chambered versions of the shotgun are easily accomplished with just the elimination of the three ports machined for three and a half inch guns.. Remington's "Pro Bore" take on the Browning oversized barrels hasn't been used throughout the Remington line, but it is back on the Versamax. According to the recent Cabela's waterfowl catalogue, the ticket to ride is about $1200 for the black, $1350 for the camo version. Estimated availability is September, 2010, for the 28 inch black synthetic models, the camo model scheduled for November, 2010, with 26 inch barreled versions estimated to follow in January, 2011. So, what do I think? Several hundred people have already asked, so here goes. All of this is mentioned with the caveat that production models are often not at all the same from prototype, tool room guns. I think the design is generally sound, as you would expect from a take-off on the Benelli M4 dual piston gas action. As far as the "Versamax" porting array, it is more gimmick than substance. It can hardly be considered self-compensating, for the simple reason that gas flow from a shell is not directly rated to shell length. Take any conventional 2-3/4 inch gas piston gun. Fire a representative 1-1/8 oz. 1200 fps target load, then fire a 1-1/2 oz. classic "baby magnum." It is a dramatic difference. With the lack of a dynamic gas exhaust system, the Versamax can be no different. Sometimes a cigar is just a cigar and a hole is just a hole. It cannot possibly react to gas flow, no dumb old hole knows what is flowing through it. The same is true on the other end of the spectrum, as in 3-1/2 inch shells. A 3-1/2 inch factory lead turkey load may well be pushing 2-1/4 oz. of shot out the muzzle. A high-velocity steel 3-1/2 inch factory shell may have only a 1-3/8 oz. payload. The turkey load has more than a 63% heavier payload, yet the three static gas ports to be used with either of these shells has no chance of being able to adapt to the divergent flow rates generated by these different shells. 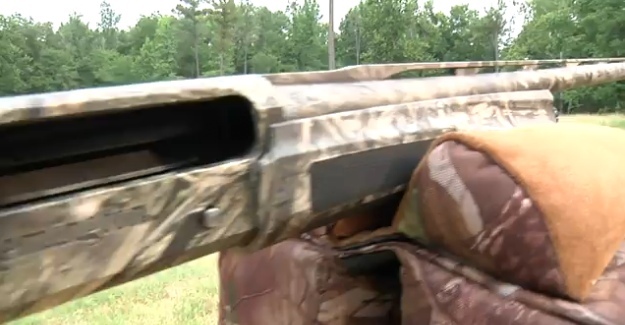 At about three quarters of a pound heavier than the Beretta A400 and over a half-pound heavier than Browning Maxus and Benelli Vinci models, the Versamax is far too heavy to find great favor as a pheasant or a quail gun for the exact same reason that the similarly weighted Beretta Xtrema2 has failed in that department. In earlier three-way comparison, I commented that the "A400 version of the Xtrema2 is easier on the eyes, harder on the wallet, more suitable when the application involves significant walking and carrying, perhaps a bit less suitable as a dedicated waterfowler with its shinier barrel and lighter weight." In the quest for the versatile autoloader, the Versamax doesn't make the grade against the A400 or the Browning Maxus due not to a prophecy of function, but to the reality of weight. As a dedicated waterfowl gun, it has a very good chance of being competitive against the Xtrema2. There is little doubt that Remington will suggest that their thicker Supercell recoil pad will be work wonders on the Versamax and that Beretta will suggest that the KO-equipped Xtrema2 makes the Versamax seem like the VersaMule. In reality, heavy gas guns are invariably soft shooters as a matter of course, so the individual will have to sort that one out. Update: On November 12, 2010, Remington issued a recall on the fledgling Versamax, telling you not to use it, warning of "property damage, serious personal injury or death." See VERSAMAX RECALL for the full and complete notice.